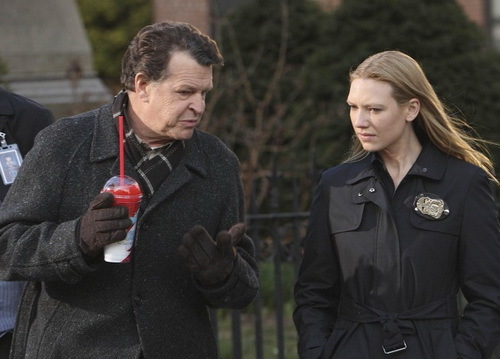 This Friday, 1-18-13, the Fox network series Fringe, will meet its end with its series finale. Thus ending a five-year/season run for what was once a pretty fun show that helped pass the time. Fringe starred Anna Torv, Joshua Jackson, Jasika Nicole & John Noble (who all starred in the most episodes to date, 100) in a story of a secret division of the FBI called the Fringe Division, as they were tasked with chasing down the oddest of crimes. It was a modern day X-Files. And John Noble really held up his end of the four-some that starred in the series. He was quirky, serious, nutso and driven. All at once or one at a time, and he pulled these different states-of-mind off pretty seamlessly. I'm a fan of his now, that's for sure. Throughout the series, there in just about every episode, an observer could be spotted in the background somewhere, in some single scene. These were mysterious bald guys. Fox even took advantage of these mysterious men and placed them in actual sporting events like NASCAR races and football games. But as we have come to learn, these bald men weren't nice. At least in this fifth and final season, as we were to discover. And therein lies my angst. This fifth season, where we jumped forward in time, has never really sat well with me. The story veered away from the fun that made the series what it was for me. Though if truth be told, I suspect the showrunners were headed here any way. Having been created by J.J. Abrams, Alex Kurtzman, Roberto Orci and helmed by the latter two, the series was something that filled the night. 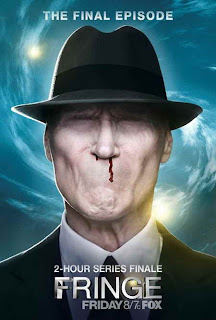 Be it as it may, Fringe is coming to it's close this upcoming Friday, and the preview trailer for the series finale actually looks pretty impressive. Though I've grumbled about this season, I've watched from day one, and because I committed, I looked to see this series through to the end. So I will tune in and chime in after I've seen the show and we can chat more about it then.